When the App Store first launched, I don’t think anyone imagined that the iPhone would be such a marvelous platform for retro gamers. The amount of games out there that are either direct ports or heavily inspired by classic titles has been absolutely awesome both for fans of these vintage games and newcomers who are getting to experience the roots of video gaming for the first time. Revolutionary Concepts, the guys behind the phenomenal port of the LaserDisc arcade game Cobra Command [$2.99] just revealed a video of their next game, Karate Champ. The attention to detail is absolutely astounding, between the arcade style cabinet controls, the gameplay itself, and even the announcer voice which is a dead ringer for the Commodore 64 SAM voice. 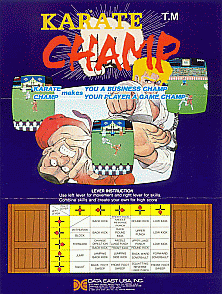 Released to arcades in 1984, Karate Champ was one of the first fighting games. It later made its way to the Apple II, the Commodore 64, and the NES among other platforms. According to Revolutionary Concepts, it will be submitted to Apple this week and it will launch at $1.99 as soon as it is approved.